We have original science fiction by An Owomoyela (“Undermarket Data”) and E. Catherine Tobler (“A Box, a Pocket, a Spaceman”), along with SF reprints by Gardner Dozois (“Morning Child”) and David I. Masson (“Traveller’s Rest”). Plus, we have original fantasy by Tahmeed Shafiq (“The Djinn Who Sought To Kill The Sun”) and Kat Howard (“Meaningful Exchange”), and fantasy reprints by Ken Liu (“State Change”) and Gwyneth Jones (“The Grass Princess”). 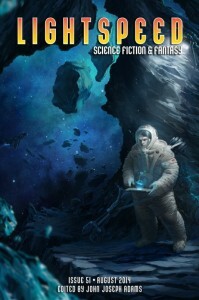 For our ebook readers, our ebook-exclusive novella is “Rule of Engagement,” by Sherwood Smith, and of course we have our usual assortment of author and artist spotlights, along with feature interviews with bestselling authors Christopher Moore and Elizabeth Bear. We’ve also got novel excerpts from Dru Pagliassotti (Clockwork Secrets) and Peter Watts (Echopraxia).